How to instruct GRUB to use an old kernel as default ? I tried to update my kernel to the latest, as it was suggested (with a big red "at your own risks" label) by the update manager to 4.9.0. I have an issue with it, that the 3.16.0 kernel had not. Now that I did update it, how can I instruct GRUB to ignore the 4.9.0 without deleting the kernel ? 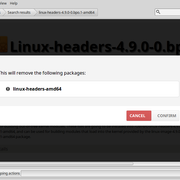 Also, rather than manually deleting the kernel and image files, does anyone knows how to remove the linux-headers-4.9.0* packages without removing the meta-package linux-headers-amd64 and keeping a working installation ? I have to say I liked the previous versions of the upgrade manager way better in that regards. It was nice to be able to specify the default booting kernel from a list. Re: How to instruct GRUB to use an old kernel as default ? Sorry i was wrong. I didon't see it was the LMDE section. Use software manager to remove the newer kernel. Grub reverts to the highest kernel number by default. all41 wrote: Use software manager to remove the newer kernel. Yeah, that's what I wanted to do, but then the manager tells me that "linux-headers-amd64" will also be removed. Isn't that a meta package containing all the kernels ? Would I not end up with a system without any kernel ? grumpy_geek wrote: "Re-Order Grub Boot Menu"
I already am using the "saved" grub entry, but would prefer to not resort to that.